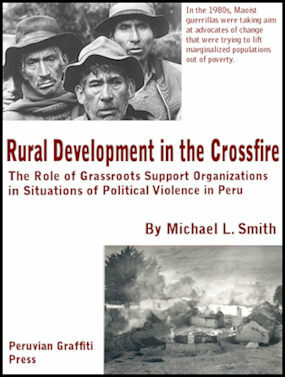 This book examines the complex factors that led to political violence of the 1980s and early 1990s and the rural setting where the most intense fighting took place. 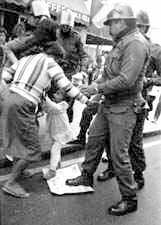 The Lima government responded to Shining Path's threat by unleashing the security forces on communities they did not understand, and the Senderista guerrillas took advantage of the fisures in local society. The bloodshed scarred the society for years to come, costing as many as 70,000 lives. Eventually Shining Path's leader was captured in 1992 and the insurgency collapsed within months. When I covered Peru as a journalist, I had to report on a lot of bad news -- flawed democracy, political violence, economic mismanagement, and other catastrophes. But I also prided myself in finding a positive angle for viewing what was happening in Peru: soup kitchens, education, popular expression, grassroots democracy, bootstrap capitalism, as well as the unique realms of the Andes, Amazon and Pacific Oceans and the contrasts between Lima and the provinces. As I got a chance to travel more broadly in the country, I discovered that its real worth was in its people and their continuing struggle to forge ahead. My goals for this web site are something similar: amid all the reporting about flawed democracy, corruption... I want to make Peru more understandable by providing background, context and a perspective on current events and also to underscore the virtues of Peruvians and Peru that span centuries and are rooted in the soil. In order to comprehend Peruvian politics, you need to know the landscape. 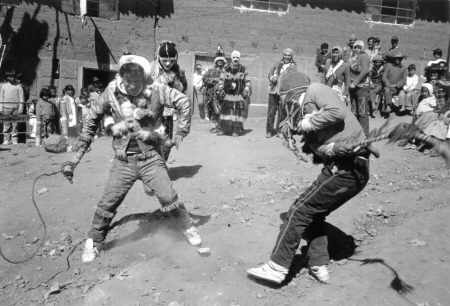 The 2001 elections were shaped by what has happened in Peru over the past three decades, including guerrillas and what remains of the political parties. It means grasping the catastrophe of the 1985-90 government of President Alan Garcia, the ensuing political tsunami of Alberto Fujimori and the countershocks of Alejandro Toledo's Peru Posible movement. Covering the news in Peru has not been a spectator sport. Observers tend to be swept into the events. Journalism has been dominated by arrogant owners, improvised reporters and obsessive editors. People in power view the media with suspicion. Information is rationed like bottled water in hell. My take on the scene. For tracking Peruvian current events from an international perspective, try Yahoo Full Coverage or Lima Post. My weblog follows the coverage of the English language news media on the Web. Peru is shaped by its geography and ecology. It's a unique place in the world, bringing together hundreds of ecological niches. It is also an environment of high risk for humans because of earthquakes, land- and mudslides, draught and other natural catastrophes that ravage the land and people frequently. So take a geography lesson. See a startling picture of the toppling towers of the Arequipa cathedral in the June 2001 quake. After all the messy politics, the tragedies, the Peru Profundo is the redeeming qualities that make us love the country and its people. Right now, Peru's future is not too clear for the next couple of years... or decades. But the dynamics have emerged out of the past that can at least be researched and interpreted. Millennia ebb and flow, centuries dawn and fade, catastrophies rupture the landscpe, the subtle interaction between man and land led to the present and shape the future. That's history. If we can't discern the future, this inquiry into the past may raised the possibility that we can understand where the country is headed. A broader look at what constitutes the soul and spirit of the country can be found in an essay, An Andean country in the making. Peru is a picturesque country. We are reminded by all the bright postcards, the tourist snapshots and the professional photographer's portfolio that all try to capture the beauty and atmosphere. But Peru can take another angle. 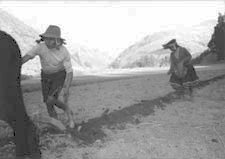 Several web sites that show that Peruvians are very capable of displaying a unique vision: a cooperative of professional photographers and talented novices and provincial portrait takers who also captured the campesino world during the first half of the 20th century. Throughout this site, I am using the TAFOS photographs to show the other face to the country. I worked with them on many occasions and consider their work an invaluable experiment in popular expression. Peru's depths are revealed through the written word. Mario Vargas Llosa, José Maria Arguedas, Julio Ramón Ribeyro, and the list goes on. The cultural manifestations stir multiple explorations. A short introduction can only start the discovery. A generation of Peruvian poets gave me my first chance to dive into the profundity of Peru: Antonio Cisneros, Mirko Lauer, Blanca Varela, Marcos Martos, Abelardo Sanchez León. It's hard to imagine the kind of effect that a new technology like the Internet can have on a developing country. Just look at the cybercafés around town squares and markets. Over the past year, I have been impressed by the amount and quality of Peruvian material on the Internet. When I started out five years ago, the number of good Peruvian sites could be counted on a quipus . There is less of a need for simple pointers. See La Lista for a quick guide to the most prominent Peru-related directories and sites. Peruvian football/soccer has bounced back from the disastrous performances of the late 1980s and early 1990s. Peruvian players are being snapped up by Argentinean, Mexican and even European teams. Here in Washington, we have a Peruvian, midfielder Chino Alegria (20), on DC United. The national team had been putting in credible performances and raised hopes that it might qualify for the 2002 World Cup. But in the playoffs, the team has been incapable of scoring goals and torpedoed its chances by the end of 2000. While we're on the subject of sports, the great success story of Peruvian athletics has been women's volleyball. It had been a consistent winner, including a silver medal at the Olympics. I can remember the whole country stopping to watch games broadcasted at odd hours from Asia or Europe. More recently, it's going through some hard times since Brazil eclipsed it as the preeminent volley ball country in South America and the unique seedbed of players has dried up.